When I opened my package of washed fleece from Lesley Prior for the Bowmont Challenge, my first thought was "Wow! This stuff is heavenly!" Coming from the UK, the fleece was already washed in compliance with overseas export regulations, so I can't give you an evaluation of the raw fleece, but here's my assessment for the washed. 2. Color - white. Tips white to cream. 4. Cleanliness - Very clean. No dirt, no grease. Scant amount of VM present. 11. Crimp - 12 per inch. No wave or curl. 12. Staples are open and finger draft easily. No cotting. 13. Fineness - exceptional! Definitely next-to-skin wearable, even for a baby. 14. Felting - easy. It only took a couple of minutes to make a small felt marble. 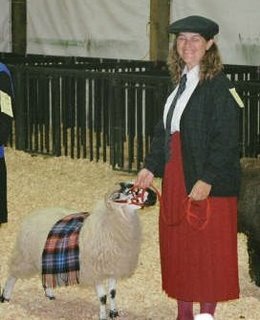 Since Bowmont is a Merino/Shetland cross, I would love to be able to compare it to fleece from both of those breeds. However, I've never worked with either Merino or Shetland in fleece form (either raw or washed), only as commercially prepared roving. Another thing I am curious about would be weight before and after washing, as it would give me some idea of the grease content. I do know that Bowmont fleece does not have as high a lanolin content as Merino, but I am unsure about the lanolin in Shetland. Lots of things to be curious about! At this point my plan is to spin it as a fine yarn, probably matching the crimp by spinning it at 12 twists per inch. I don't think this will take too long to accomplish as it is hard to keep my hands off it! Next - Spinning the fleece. Hey - that is GORGEOUS! How fun to have it to play with. I think I know someone who could help you with a shetland fleece if you are interested :-) T.
I have some of the Shrek fleeces Elizabeth Ashford had - you've inspired me to post about those. I have some white locks of a couple different types of Shetlands I'll send you. Please let me know your snail mail address. That would be great, Franna. I couldn't find a blog or contact info for you, but if you'll email me at leighsfiberjournal at gmail dot com, we can work out the details. Thanks!